The only Gaelic Choir in Perthshire featured in an impressive line up of musicians from as far away as India and Australia in Saturday’s Pearls of the Tay Concert, one of three main events to mark the opening of the new Perth Concert Hall. The evening was an eclectic mix of Scottish traditional songs and music, with original compositions from musical director and percussionist Trilok Gurtu, creating a spectacular fusion of Asian and Scottish sounds. The Aberfeldy and District Gaelic Choir accompanied Fraser Anderson in his gentle rendition of the Loch Tay Boat Song, and were joined by Mridula Desai who added her distinctive Asian tones to the famous Perthshire song. 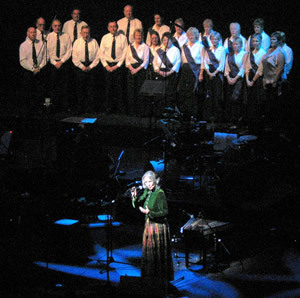 The Choir also accompanied well-known Scottish traditional singer Margaret Bennett in her moving “Griogal Cridhe” (Glenlyon Lament). Continuing the Gaelic theme, the Choir sang “Crodh Chailein” (Colin’s Cattle) and “Athchuinge”, a Gaelic blessing.